Designed to meet the needs of dosing pump manufacturers, dosing system builders and end users, Prochem pulsation dampers provide a simple, inexpensive and reliable means of stabilising flows and pressures whilst reducing pipework vibrations. The dampers work by removing the pressure peaks from the discharge of reciprocating dosing pumps. In doing this, they prevent damage to equipment, avoid excessive vibration and allow accurate flow measurement. When fitted to the suction side of dosing pumps, the dampers will also prevent cavitation on long suction lines. 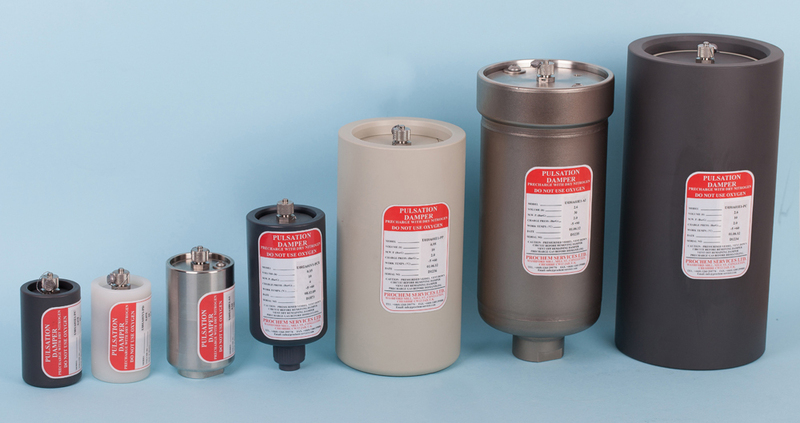 Prochem dampers are available in three basic configurations – bladder, membrane, and bellows – to meet the various requirements of pressure, corrosion resistance and capacity.